Features of the Proposed Yosemite National Park. By John Muir. The Century Magazine, Vol. XL., No. 5 (September, 1890). Big Tuolumne Meadows with Mount Dana and Mount Gibbs, from near the Soda Springs. THE upper Tuolumne Valley is the widest, smoothest, most serenely spacious, and in every way the most delightful summer pleasure park in all the high Sierra. And since it is connected with Yosemite by two good trails, and with the levels of civilization by a broad, well-graded carriage-road that passes between Yosemite and Mount Hoffman, it is also the most accessible. It lies in the heart of the high Sierra at a height of from 8500 to 9000 feet above the level of the sea, at a distance of less than ten miles from the northeastern boundary of the Yosemite reservation. 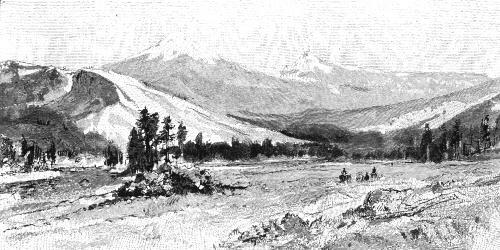 It is bounded on the southwest by the gray, jagged, picturesque Cathedral range, which extends in a south-easterly direction from Cathedral Peak to Mount Lyell and Mount Ritter, the culminating peaks of the grand mass of icy mountains that form the "crown of the Sierra"; on the northeast, by a similar range or spur, the highest peak of which is Mount Conness; on the east, by the smooth, majestic masses of Mount Dana, Mount Gibbs, Mount Ord, and others, nameless as yet, on the axis of the main range; and on the west by a heaving, billowy mass of glacier-polished rocks, over which the towering masses of Mount Hoffman are seen. Down through the open sunny levels of the valley flows the bright Tuolumne River, fresh from many a glacial fountain in the wild recesses of the peaks, the highest of which are the glaciers that lie on the north sides of Mount Lyell and Mount McClure. Along the river are a series of beautiful glacier meadows stretching, with but little interruption, from the lower end of the valley to its head, a distance of about twelve miles. These form charming sauntering grounds from which the glorious mountains may be enjoyed as they look down in divine serenity over the majestic swaths of forest that clothe their bases. Narrow strips of pine woods cross the meadow-carpet from side to side, and it is somewhat roughened here and there by groves, moraine boulders, and dead trees brought down from the heights by avalanches; but for miles and miles it is so smooth and level that a hundred horsemen may ride abreast over it. The main lower portion of the meadow is about four miles long and from a quarter to half a mile wide; but the width of the valley is, on an average, about eight miles. Tracing the river we find that it forks a mile above the Soda Springs, which are situated on the north bank opposite the point where the Cathedral trail comes in--the main fork turning southward to Mount Lyell, the other eastward to Mount Dana and Mount Gibbs. Along both forks strips of meadow extend almost to their heads. The most beautiful portions of the meadows are spread over lake basins, which have been filled up by deposits from the river. A few of these river-lakes still exist, but they are now shallow and are rapidly approaching extinction. The sod in most places is exceedingly fine and silky and free from rough weeds and bushes; while charming flowers abound, especially gentians, dwarf daisies, ivesias, and the pink bells of dwarf vaccinium. On the banks of the river and its tributaries Cassiope and Bryanthus may be found where the sod curls over in bosses, and about piles of boulders. The principal grass of these meadows is a delicate Calamagrostis with very slender leaves, and when it is in flower the ground seems to be covered with a faint purple mist, the stems of the spikelets being so fine that they are almost invisible, and offer no appreciable resistance in walking through them. Along the edges of the meadows beneath the pines and throughout the greater part of the valley tall ribbon-leaved grasses grow in abundance, chiefly Bromus, Triticum, and Agrostis. In October the nights are frosty, and then the meadows at sunrise, when every leaf is laden with crystals, are a fine sight. The days are warm and calm, and bees and butterflies continue to waver and hum about the late-blooming flowers until the coming of the snow, usually late in November. Storm then follows storm in close succession, burying the meadows to a depth of from ten to twenty feet, while magnificent avalanches descend through the forests from the laden heights, depositing huge piles of snow mixed with uprooted trees and boulders. In the open sunshine the snowy lasts until June, but the new season's vegetation is not generally in bloom until late in July. Perhaps the best time to visit this valley is-in August. The snow is then melted from the woods, and the meadows are dry and warm, while the Weather is mostly sunshine, reviving and exhilarating in quality; and the few clouds that rise and the showers they yield are only enough for freshness, fragrance, and beauty. Tuolumne Meadows, looking south. Unicorn Peak and Cathedral Peak. The groves about the Soda Springs are favorite camping-grounds on account of the pleasant-tasting, ice-cold water of the springs, charged with carbonic acid, and because of the fine views of the mountains across the meadow--the Glacier Monument, Cathedral Peak, Cathedral Spires, Unicorn Peak, and their many nameless companions rising in grand beauty above a noble swath of forest that is growing on the left lateral moraine of the ancient Tuolumne Glacier, which, broad and deep and far-reaching, exerted vast influence on the scenery of this portion of the Sierra. But there are fine camping-grounds all along the meadows, and one may move from grove to grove every day all summer enjoying a fresh home and finding enough to satisfy every roving desire for change. There are four capital excursions to be made from here--to the summits of Mounts Dana and Lyell; to Mono Lake and the volcanoes, through Bloody Cañon; and to the great Tuolumne Cañon as far as the foot of the main cascades. All of these are glorious, and sure to be crowded with joyful and exciting experiences; but perhaps none of them will be remembered with keener delight than the days spent in sauntering in the broad velvet lawns by the river, sharing the pure air and light with the trees and mountains, and gaining something of the peace of nature in the majestic solitude. View of Cathedral Peak from the west, above Lake Tenaya. View of a part of the Grand Cascades, Big Tuolumne Cañon. The excursion to the top of Mount Dana is a very easy one; for though the mountain is 13,000 feet high, the ascent from the west side is so gentle and smooth that one may ride a mule to the very summit. Across many a busy stream, from meadow to meadow, lies your flowery way, the views all sublime; and they are seldom hidden by irregular foregrounds. As you gradually ascend, new mountains come into sight, enriching the landscape; peak rising above peak with its individual architecture, and its masses of fountain snow in endless variety of position and light and shade. Now your attention is turned to the moraines, sweeping in beautiful curves from the hollows and cañons of the mountains, regular in form as railroad embankments, or to the glossy waves and pavements of granite rising here and there from the flowery sod, polished a thousand years ago and still shining. Towards the base of the mountain you note the dwarfing of the trees, until at a height of about 11,000 feet you find patches of the tough white-barked pine pressed so flat by the ten or twenty feet of snow piled upon them every winter for centuries that you may walk over them as if walking on a shaggy rug. And, if curious about such things, you may discover specimens of this hardy mountaineer of a tree, not more than four feet high and about as many inches in diameter at the ground, that are from two hundred to four hundred years old, and are still holding on bravely to life, making the most of their short summers, shaking their tasseled needles in the breeze right cheerily, drinking the thin sunshine, and maturing their fine purple cones as if they meant to live forever. The general view from the summit is one of the most extensive and sublime to be found in all the range. To the eastward you gaze far out over the hot desert plains and mountains of the "Great Basin," range beyond range extending with soft outlines blue and purple in the distance. More than six thousand feet below you lies Lake Mono, overshadowed by the mountain on which you stand. It is ten miles in diameter from north to south and fourteen from east to west, but appears nearly circular, lying bare in the treeless desert like a disk of burnished metal, though at times it is swept by storm-winds from the mountains and streaked with foam. To the south of the lake there is a range of pale-gray volcanoes, now extinct, and though the highest of them rise nearly two thousand feet above the lake, you can look down into their well-defined circular, cup-like craters, from which, a comparatively short time ago, ashes and cinders were showered over the surrounding plains and glacier-laden mountains. To the westward the landscape is made up of gray glaciated rocks and ridges, separated by a labyrinth of cañons and darkened with lines and broad fields of forest, while small lakes and meadows dot the foreground. Northward and southward the jagged peaks and towers that are marshaled along the axis of the range are seen in all their glory, crowded together in some places like trees in groves, making landscapes of wild, extravagant, bewildering magnificence, yet calm and silent as the scenery of the sky. Some eight glaciers are in sight. One of these is the Dana Glacier on the northeast side of the mountain, Iying at the foot of a precipice about a thousand feet high, with a lovely pale-green lake in the general basin a little below the glacier. This is one of the many small shrunken remnants of the vast glacial system of the Sierra that once filled all the hollows and valleys of the mountains and covered all the lower ridges below the immediate summit fountains, flowing to right and left away from the axis of the range, lavishly fed by the snows of the glacial period. In the excursion to Mount Lyell the immediate base of the mountain is easily reached on horseback by following the meadows along the river. Turning to the southward above the forks of the river you enter the Lyell branch of the valley, which is narrow enough and deep enough to be called a cañon. It is about eight miles long and from 2000 to 3000 feet deep. The flat meadow bottom is from about 300 to 200 yards wide, with gently curved margins about 50 yards wide, from which rise the simple massive walls of gray granite at an angle of about thirty-three degrees, mostly timbered with a light growth of pine and streaked in many places with avalanche channels. Towards the upper end of the cañon the grand Sierra crown comes into sight, forming a sublime and finely balanced picture, framed by the massive cañon walls. In the foreground you have the purple meadow fringed with willows; in the middle distance, huge swelling bosses of granite that form the base of the general mass of the mountain, with fringing lines of dark woods marking the lower curves, but smoothly snow-clad except in the autumn. The south side of Mount Lyell. There is a good camping-ground on the east side of the river about a mile above. A fine cascade comes down over the cañon wall in telling style and makes fine camp music. At one place near the top careful climbing is necessary, but it is not so dangerous or difficult as to deter any climber of ordinary strength and skill, while the views from the summit are glorious. To the northward are Mammoth Mountain, Mounts Gibbs, Dana, Warren, Conness, and many others unnumbered and unnamed; to the southeast the indescribably wild and jagged range of Mount Ritter and the Minarets; southwestward stretches the dividing ridge between the North Fork of the San Joaquin and the Merced, uniting with the Obelisk or Merced group of peaks that form the main fountains of the Illilouette branch of the Merced River; and to the northwestward extends the Cathedral spur. All these spurs, like distinct ranges, meet at your feet. Therefore you look over them mostly in the direction of their extension and their peaks seem to be massed and crowded together in bewildering combinations; while immense amphitheaters cañons and subordinate masses, with their wealth of lakes, glaciers, and snow-fields, maze and cluster between them. In making the ascent in June or October the glacier is easily crossed, for then its snow mantle is smooth or mostly melted off. But in midsummer the climbing is exceedingly tedious, because the snow is then weathered into curious and beautiful blades, sharp and slender, and set on edge in a leaning position. 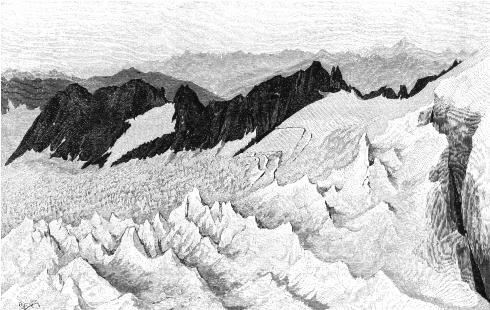 They lean towards the head of the glacier, and extend across from side to side in regular order in a direction at right angles to the direction of greatest declivity, the distance between the crests being about two or three feet, and the depth of the troughs between them about three feet. No more interesting problem is ever presented to the mountaineer than a walk over a glacier thus sculptured and adorned. Lyell Glacier, from the edge of the Great Fissure. The Lyell Glacier is about a mile wide and less than a mile long, but presents, nevertheless, all the more characteristic features of large, river-like glaciers--moraines, earth-bands, blue-veins, crevasses etc., while the streams that issue from it are turbid with rock-mud, showing its grinding action on its bed. And it is all the more interesting since it is the highest and most enduring remnant of the great Tuolumne Glacier, whose traces are still distinct fifty miles away, and whose influence on the landscape was so profound. 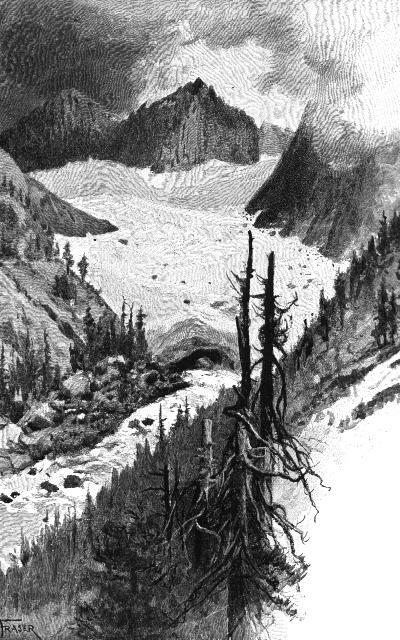 The McClure Glacier, once a tributary of the Lyell, is much smaller. Eighteen years ago I set a series of stakes in it to determine its rate of motion which towards the end of summer, in the middle of the glacier, I found to be a little over an inch in twenty-four hours. 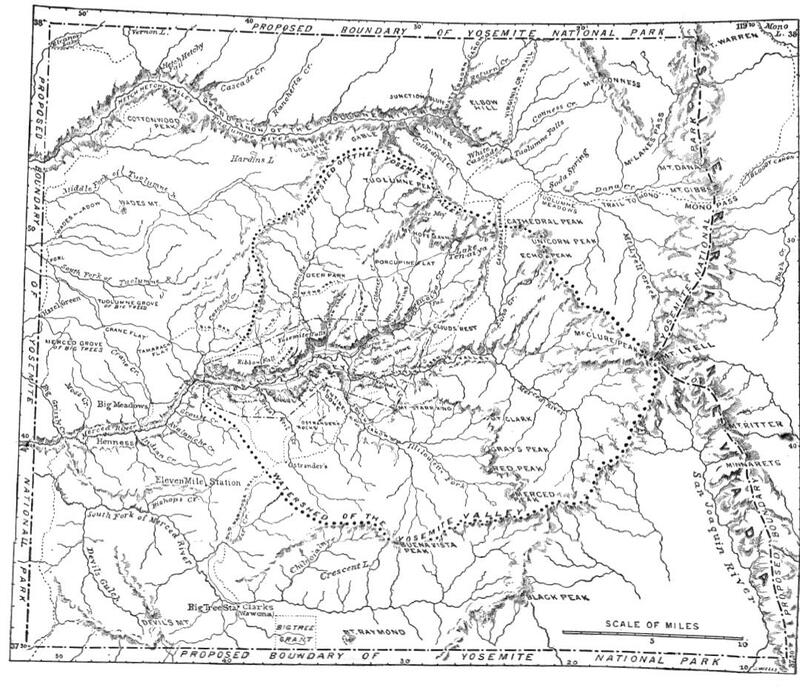 The trip to Mono from the Soda Springs can be made in a day, but Bloody Cañon will be found rough for animals. The scenery of the cañon, however, is wild and rich, and many days may profitably be spent around the shores of the lake and out on its islands and about the volcanoes. Looking down on Lake Tenaya. In making the trip down the Big Tuolumne Cañon animals may be led as far as a small, grassy, forested lake basin that lies below the crossing of the Virginia Creek trail. And from this point any one accustomed to walk on earthquake boulders carpeted with cañon chaparral, can easily go down the cañon as far as the big cascades and return to camp in one day. Many, however, are not able to do this, and it is far better to go leisurely, prepared to camp anywhere, and enjoy the marvelous grandeur of the place. Tuolumne River near the head of the Great Cañon. The cañon begins near the lower end of the meadows and extends to the Hetch Hetchy Valley, a distance of about eighteen miles, though it will seem much longer to any one who scrambles through it. It is from 1200 to about 5000 feet deep, and is comparatively narrow, but there are several fine, roomy, park-like openings in it, and throughout its whole extent Yosemite features are displayed on a grand scale--domes, El Capitan rocks, gables, Sentinels, Royal Arches, glacier points, Cathedral Spires, etc. There is even a Half Dome among its wealth of rock forms, though less sublime and beautiful than the Yosemite Half Dome. It also contains falls and cascades innumerable. The sheer falls, except when the snow is melting in early spring, are quite small in volume as compared with those of Yosemite and Hetch Hetchy, but many of them are very beautiful, and in any other country would be regarded as great wonders. But it is the cascades or sloping falls on the main river that are the crowning glory of the cañon, and these in volume, extent, and variety surpass those of any other cañon in the Sierra. The most showy and interesting of the cascades are mostly in the upper part of the cañon, above the point where Cathedral Creek; and Hoffman Creek enter. For miles the river is one wild, exulting, on-rushing mass of snowy purple bloom, spreading over glacial waves of granite without any definite channel, and through avalanche taluses, gliding in silver plumes, dashing and foaming through huge boulder-dams, leaping high into the air in glorious wheel-like whirls, tossing from side to side, doubling, glinting, singing in glorious exuberance of mountain energy. Every one who is anything of a mountaineer should go on through the entire length of the cañon, coming out by Hetch Hetchy. There is not a dull step all the way. With wide variations it is a Yosemite Valley from end to end. Entrance to Hetch Hetchy Valley from Smith Trail. MOST people who visit Yosemite are apt to regard it as an exceptional creation, the only valley of its kind in the world. But nothing in Nature stands alone. She is not so poor as to have only one of anything. The explorer in the Sierra and elsewhere finds many Yosemites that differ not more than one tree differs from another of the same species. They occupy the same relative positions on the mountain flanks, were formed by the same forces in the same kind of granite, and have similar sculpture, waterfalls, and vegetation. 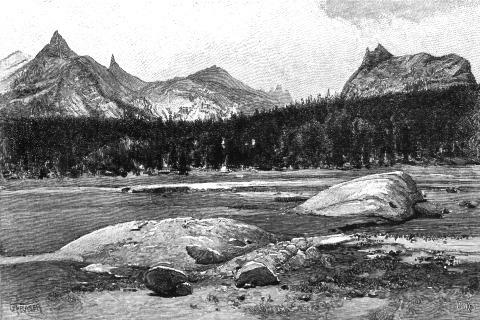 The Hetch Hetchy Valley has long been known as the Tuolumne Yosemite. 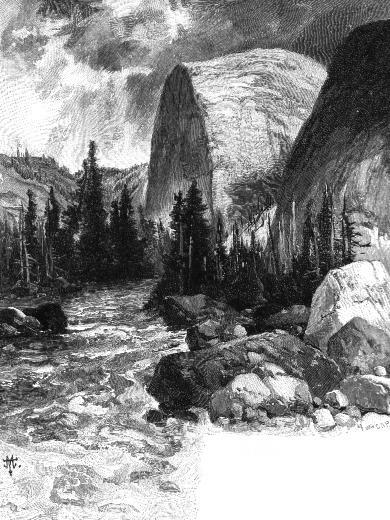 It is said to have been discovered by Joseph Screech, a hunter, in 1850, a year before the discovery of the great Merced Yosemite. It lies in a northwesterly direction from Yosemite, at a distance of about twenty miles, and is easily accessible to mounted travelers by a trail that leaves the Big Oak Flat road at Bronson's Meadows, a few miles below Crane Flat. But by far the best way to it for those who have useful limbs is across the divide direct from Yosemite. Leaving the valley by Indian Cañon or Fall Cañon, you cross the dome-paved basin of Yosemite Creek, then bear to the left around the head fountains of the South Fork of the Tuolumne to the summit of the Big Tuolumne Cañon, a few miles above the head of Hetch Hetchy. Here you will find a glorious view. Immediately beneath you, at a depth of more than 4000 feet, you see a beautiful ribbon of level a ground, with a silver thread in the middle of it, and green or yellow according to the time of year. That ribbon is a strip of meadow, and the silver thread is the main Tuolumne River. The opposite wall of the cañon rises in precipices, steep and angular, or with rounded brows like those of Yosemite, and from this wall as a base extends a fine wilderness of mountains, rising dome above dome, ridge above ridge, to a group of snowy peaks on the summit of the range. Of all this sublime congregation of mountains Castle Peak is king: robed with snow and light, dipping unnumbered points and spires into the thin blue sky, it maintains amid noble companions a perfect and commanding individuality. 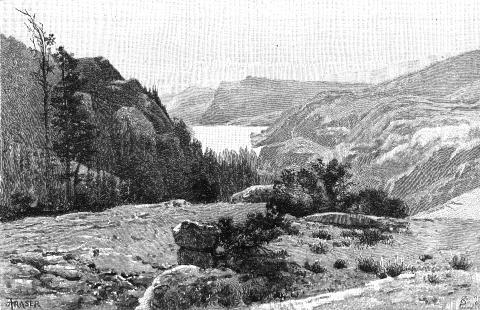 Kolána Rock, Hetch Hetchy Valley. You will not encounter much difficulty in getting down into the cañon, for bear trails may readily be found leading from the upper feeding-grounds to the berry gardens and acorn orchards of Hetch Hetchy, and when you reach the river you have only to saunter by its side a mile or two down the cañon before you find yourself in the open valley. Looking about you, you cannot fail to discover that you are in a Yosemite valley. As the Merced flows through Yosemite, so does the Tuolumne through Hetch Hetchy. The bottom of Yosemite is about 4000 feet above sea level, the bottom of Hetch Hetchy is about 3800 feet, and in both the walls are of gray granite and rise abruptly in precipices from a level bottom, with but little debris along their bases. Furthermore it was a home and stronghold of the Tuolumne Indians, as Ahwahne was of the grizzlies. Standing boldly forward from the south wall near the lower end of the valley is the rock Kolána, the outermost of a picturesque group corresponding to the Cathedral Rocks of Yosemite, and about the same height. Facing Kolána on the north side of the valley is a rock about 1800 feet in height, which presents a bare, sheer front like El Capitan, and over its massive brow flows a stream that makes the most graceful fall I have ever seen. Its Indian name is Tu-ee-u-la-la, and no other, so far as I have heard, has yet been given it. From the brow of the cliff it makes a free descent of a thousand feet and then breaks up into ragged, foaming web of cascades among the boulders of an earthquake talus. Towards the end of summer it vanishes, because its head streams do not reach back to the lasting snows of the summits of the range, but in May and June it is indescribably lovely. The only fall that I know with which it may fairly be compared is the Bridal Veil, but it excels even that fall in peaceful, floating, swaying gracefulness. 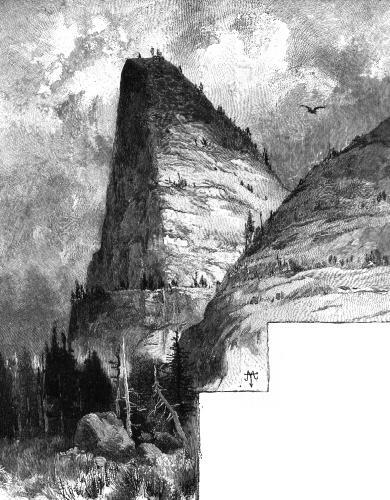 For when we attentively observe the Bridal Veil, even towards the middle of summer when its waters begin to fail, we may discover, when the winds blow aside the outer folds of spray dense comet-shaped masses shooting through the air with terrible energy; but from the top of the cliff, where the Hetch Hetchy veil first floats free, all the way to the bottom it is in perfect repose. Again, the Bridal Veil is in a shadow-haunted nook inaccessible to the main wind currents of the valley, and has to depend for many of its gestures on irregular, teasing side currents and whirls, while Tu-ee-u-la-la, being fully exposed on the open cliff, is sun drenched all day, and is ever ready to yield graceful compliance to every wind that blows. Most people unacquainted with the behavior of mountain streams fancy that when they escape the bounds of their rocky channels and launch into the air they at once lose all self-control and tumble in confusion. On the contrary, on no part of their travels do they manifest more calm self-possession. Imagine yourself in Hetch Hetchy. It is a sunny day in June, the pines sway dreamily, and you are shoulder-deep in grass and flowers. Looking across the valley through beautiful open groves you see a bare granite wall 1800 feet high rising abruptly out of the green and yellow vegetation and glowing with sunshine, and in front of it the fall, waving like a downy scarf, silver bright, burning with white sun-fire in every fiber. In coming forward to the edge of the tremendous precipice and taking flight a little hasty eagerness appears, but this is speedily hushed in divine repose. Now observe the marvelous distinctness and delicacy of the various kinds of sun-filled tissue into which the waters are woven. They fly and float and drowse down the face of that grand gray rock in so leisurely and unconfused a manner that you may examine their texture and patterns as you would a piece of embroidery held in the hand. It is a flood of singing air, water, and sunlight woven into cloth that spirits might wear. 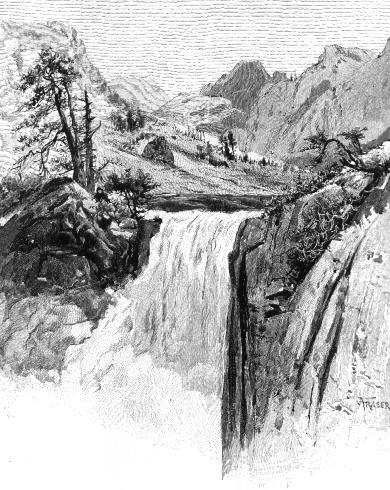 The great Hetch Hetchy Fall, called Wa-páma by the Tuolumnes, is on the same side of the valley as the Veil, and so near it that both may be seen in one view. It is about 1800 feet in height, and seems to be nearly vertical when one is standing in front of it, though it is considerably inclined. Its location is similar to that of the Yosemite Fall, but the volume of water is much greater. No two falls could be more unlike than Wa-páma and Tu-ee-u-la-la, the one thundering and beating in a shadowy gorge, the other chanting in deep, low tones and with no other shadows about it than those of its own waters, pale-gray mostly, and violet and pink delicately graded. One whispers, "He dwells in peace," the other is the thunder of his chariot wheels in power. This noble pair are the main falls of the valley, though there are many small ones essential to the perfection of the general harmony. The wall above Wa-páma corresponds, both in outlines and in details of sculpture, with the same relative portion of the Yosemite wall. Near the Yosemite Fall the cliff has two conspicuous benches extending in a horizontal direction 500 and 1500 feet above the valley. Two benches similarly situated, and timbered in the same way, occur on the same relative position on the Hetch Hetchy wall, and on no other portion. The upper end of Yosemite is closed by the great Half Dome, and the upper end of Hetch Hetchy is closed in the same way by a mountain rock. Both occupy angles formed by the confluence of two large glaciers that have long since vanished. In front of this head rock the river forks like the Merced in Yosemite. The right fork as you ascend is the main Tuolumne, which takes its rise in a glacier on the north side of Mount Lyell and flows through the Big Cañon. I have not traced the left fork to its highest source, but, judging from the general trend of the ridges, it must be near Castle Peak. Upon this left or North Fork there is a remarkably interesting series of cascades, five in number, ranged along a picturesque gorge, on the edges of which we may saunter safely and gain fine views of the dancing spray below. The first is a wide-spreading fan of white, crystal-covered water, half leaping half sliding over a steep polished pavement, at the foot of which it rests and sets forth clear and shining on its final flow to the main river. A short distance above the head of this cascade you discover the second, which is as impressively wild and beautiful as the first, and makes you sing with it as though you were a part of it. It is framed in deep rock walls that are colored yellow and red with lichens, and fringed on the jagged edges by live-oaks and sabine pines, and at the bottom in damp nooks you may see ferns, lilies, and azaleas. Three or four hundred yards higher you come to the third of the choir, the largest of the five. It is formed of three smaller ones inseparably combined, which sing divinely, and make spray of the best quality for rainbows. A short distance beyond this the gorge comes to an end, and the bare stream, without any definite channel, spreads out in a thin, silvery sheet about 150 feet wide. Its waters are, throughout almost its whole extent, drawn out in overlapping folds of lace, thick sown with diamond jets and sparks that give an exceedingly rich appearance. Still advancing, you hear a deep muffled booming, and you push eagerly on through flowery thickets until the last of the five appears through the foliage. The precipice down which it thunders is fretted with projecting knobs, forming polished keys upon which the wild waters play. 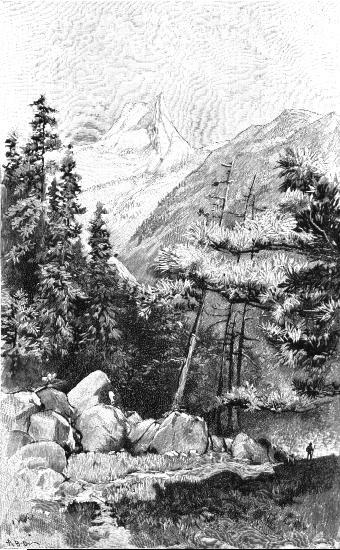 The bottom of the valley is divided by a low, glacier-polished bar of granite, the lower portion being mostly meadow land, the upper dry and sandy, and planted with fine Kellogg oaks, which frequently attain a diameter of six or seven feet. On the talus slopes the pines give place to the mountain live-oak, which forms the shadiest groves in the valley and the greatest in extent. Their glossy foliage, warm yellow-green and closely pressed, makes a kind of ceiling, supported by bare gray trunks and branches gnarled and picturesque. A few specimens of the sugar pine and tamarack pine are found in the valley, also the two silver firs. The Douglas spruce and the libocedrus attain noble dimensions in certain favorable spots, and a few specimens of the interesting Torreya Californica may be found on the south side. The brier-rose occurs in large patches, with tall, spiky mints and arching grasses. On the meadows lilies, larkspurs and lupines of several species are abundant, and in some places reach above one's head. Rock-ferns of rare beauty fringe and rosette the walls from top to bottom--Pellaea densa, P. mucronata and P. Bridgesii, Cheilanthes gracillima, Allosorus, etc. Adiantum pedatum occurs in a few mossy corners that get spray from the falls. Woodwardia radicans and Asplenium felix-faemina are the tallest ferns of the valley--six feet high, some of them. The whole valley was a charming garden when I last saw it, and the huts of the Indians and a lone cabin were the only improvements. As will be seen by the map, I have thus briefly touched upon a number of the chief features of a region which it is proposed to reserve out of the public domain for the use and recreation of the people. A bill has already been introduced in Congress by Mr. Vandever creating a national park about the reservation which the State now holds in trust for the people. It is very desirable that the new reservation should at least extend to the limits indicated by the map, and the bill cannot too quickly become a law. Unless reserved or protected the whole region will soon or late be devastated by lumbermen and sheepmen, and so of course be made unfit for use as a pleasure ground. Already it is with great difficulty that campers, even in the most remote parts of the proposed reservation and in those difficult of access, can find grass enough to keep their animals from starving; the ground is already being gnawed and trampled into a desert condition, and when the region shall be stripped of its forests the ruin will be complete. Even the Yosemite will then suffer in the disturbance effected on the water-shed, the clear streams becoming muddy and much less regular in their flow. 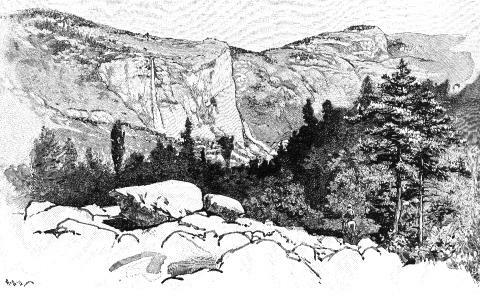 It is also devoutly to be hoped that the Hetch Hetchy will escape such ravages of man as one sees in Yosemite. Ax and plow, hogs and horses, have long been and are still busy in Yosemite's gardens and groves. All that is accessible and destructible is being rapidly destroyed--more rapidly than in any other Yosemite in the Sierra, though this is the only one that is under the special protection of the Government. And by far the greater part of this destruction of the fineness of wildness is of a kind that can claim no right relationship with that which necessarily follows use. The above map represents the limits of the park as proposed by Mr. Muir and as advocated before the Committee on Public Lands of the House of Representatives. As we go to press, the Committee seems disposed to extend the north and south limits eastward to the Nevada line, thus adding an equal amount to the area here indicated. The honor of introducing the National Park bill belongs to General William Vandever of California.--EDITOR. Transcribed by webmaster from copy in the UCSD Library, 1997.